There are several methods of adding oak flavor and aroma without using a barrel. There are three primary means of accomplishing this. 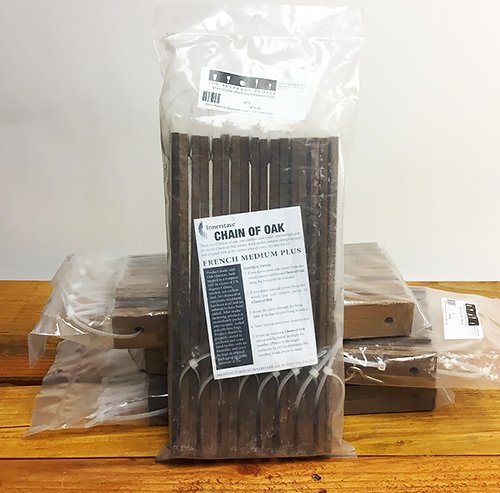 Oak Staves take about six weeks to three months for full extraction, oak extracts are instantaneous and oak chips take only 48 hours. Oak chips are made from full size staves, with the normal drying and kilning, but chipped for easy addition to any size container. They can even be added into the must during fermentation. Use about 3 oz. per 5 gallons. They impart great flavor, but aren't heavy in the aromatic department. Staves can be added any time after fermentation to tanks or barrels which have lost their oak-i-ness. We now carry two types of staves. From Mistral Barrels we are now carrying the Mini Zig Zag. 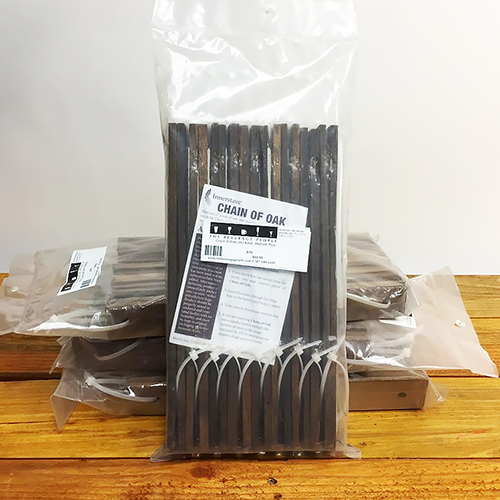 These staves have a 40% new barrel extraction perfect for 30 gallon containers. 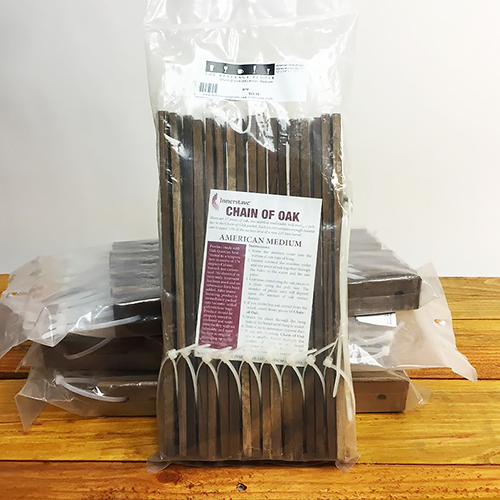 We are still carrying the larger oak staves Chain of Oak from Innerstave. These staves will give you 30% new barrel extraction in a full size barrel. Both products consist of separate oak staves that tie together with nylon ties. We carry both French and American oak in the Zig Zag and Chain og Oak, in both medium and dark toast. 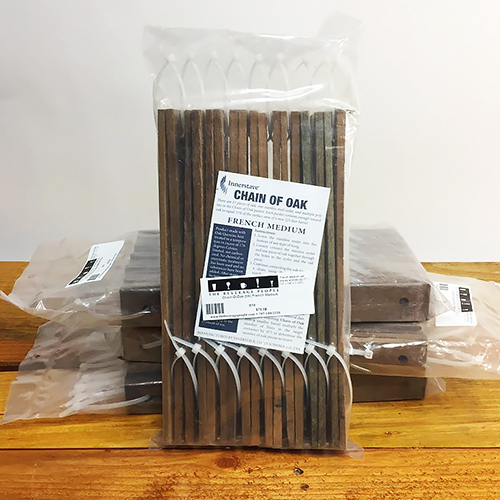 Also be sure to see our new lineup of oak staves for use in Carboys. Three sticks in 5 gallons will impart 30% new barrel oak. They come in packs of 15 in both French and American oak varieties. After extraction, the sticks can be removed and or the wine racked off the stick. Used sticks are great on the barbeque. Finally, liquid oak extract is a highly concentrated product that can be added all the way up to bottling, for making fine tune adjustments, or just finishing a wine that seems lacking in aroma.